Printable greeting card features a closeup photograph of a yellow goldfinch bird eating at a bird feeder. 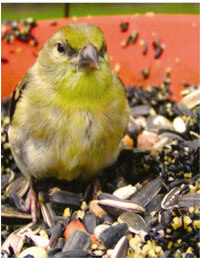 This card features an original close up photo of a goldfinch eating sunflower seeds at a bird feeder. Click to print a goldfinch note card in Adobe PDF format. Use - for the best results when printing photo greeting cards.